"In order to tell the story of Los Angeles, they erased its history." Metro Vaquero of the LAtino Urban Forum slaps our hand for selecting quotes focusing on the "bizarre and fake images" of Los Angeles, although Ice Cube may disagree. But for many of the quotes chosen, call me guilty as charged. The post is a contrast to this blog's manifesto of looking at a Los Angeles that is recreated by those who arrive to recreate themselves and see how to preserve what is left. Nonetheless, Vaquero sent over some good quotes and are listed above. Also, take a look at LAtino Urban Forum and you will see a call to action to attend council chambers Tuesday, September 11, 2007. On the agenda is a motion by 14th District Councilmember Jose Huizar to Save Elephant Hill, 110-acres of privately owned that still had 95 acres of undeveloped hillside adjacent to heavily Latino El Sereno. Elephant Hill may be L.A's last open space and oversees Los Angeles just south of South Pasadena. According to Audubon California, the summit is still a "habitat for owls, hawks, coyotes, cottontail rabbits and many other types of wildlife, as well as rare Oak and California Walnut trees." 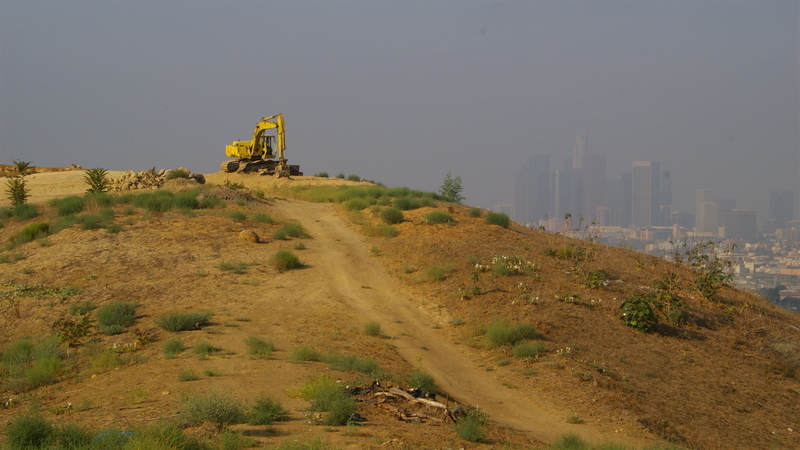 It's one of three hills in Northeast Los Angeles that have a potential to be preserved and saved. Yeah, the Militant was wondering what Tuesday's quotes were all about. His first instinct was to go semiautomatic on you, but his instincts knew there was probably an explainable reason for that. Besides, many of those quotes are antiquated and now accurately apply to other cities, such as Las Vegas, for example.